What size of account are you using for this strategy? Joe, do you think it would work good with FlexHybrid Strategy? I am sold on this particular strategy! Any particular Pairs you are using TrendMode on? Mike, I just purchase FlexEA. I am looking for a 30 minute consultation over the phone to go over the system and strategies. I’m ok with paying. Let me know what you think. Anyone have experience with the new trendMode feature? Looks very interesting. I’ve been having huge success with the scalper strategy using slightly different settings, but don’t think the trendMode would work well with it. Looks like it’s more suited for the bigger strats like Default. I use it with Default and Half-grid, working very very well so far. Do you think this EA can work perfectly on $500 account trading on 10 currency pairs? If Yes, please recommend a setting. When using trend mode, do you use lot multiplier with that too. I meant pip step multiplier. Joe, I just purchased FlexEA. and I am looking for someone with experience to give me a 30 to 60 minute consultation over the phone to go over the system and strategies. I will pay for the consultation. Would you be available. What do you need to know? Most of the questions could probably be answered here. I started about 12hrs ago and I am doing FlexHybird with the settings it comes with on 14 pairs. No trade has been triggered. Is this a good strategy or should I change something ? The lot size is set at .04, that seems very small. How is lot size calculated ? Tiltme, mind sharing your scalper settings please? Anyone interested in setting up a US based traders private chat group focused on using for this EA? Email me at jmhanna28@hotmail.com, lets put our heads together and get the most out of this EA. Also, if some very serious traders want to make a private group so we share our tips, settings, observations, management, of Flex EA, please contact me on mince@yopmail.com . I can then give my skype. Experience with Flex EA needed, or big account / big desire to archieve profit ! Just wondering if you set up a private group for this EA. Question For Nico…Is that Real or Demo Account? And What Broker are you Using? Here is my Flex trading Default strategy on 20 pairs. I literally just opened 20 charts, put Flex on all of them and changed NO settings. Here is the result. This isn’t a full blown grid trading EA like Forex Hacked, it’s much much different. Each chart has a 10% DD stoploss, and only 4/20 are allowed to have open trades at the same time. I haven’t even come close to hitting the 10% DD on any of my charts in over 6 months of trading Flex. Hi Nico, are you still using this EA? how is it going? I am actually trading 25 pairs on Flex Hybrid with the out of the box settings, and am seeing similar results. I’ve been trading small lot sizes as shown on this screenshot, and am thinking of increasing them. Flex Hybrid does not add trades to its basket until strict conditions are met, so there is less risk than with full grid trading. I’ve been very happy with it so far. Very nice Nico, can you please post what 20 pairs? Is it the 10 Steve says are best in read me file? And if yes what are the other 10? You mentioned that you’ve changed no settings using the default settings? And that includes lot size? Is the EA determining lot size, as well? to put the same strategy on 20 pairs, don’t you have to change the magic number? Ugh I’m just praying for the day this thing is no longer for sale. It’s making me way too much money and the longer it’s available to the public the greater the chance that could all end. I wonder if I could pay the vendor enough to stop selling it lol. Please is there any setting that I can use to make at least 100% profit using flex? Of course there is, but you must first ask yourself if you’re willing to risk at least 50%+ of your account in the process? You could run Default strategy on 20+ pairs, and increase Max_Charts to 10 with 0.5 Risk. You could essentially make 100% with any of their strategies if you can handle the risk. Hi, I am having trouble with Flex, is interfering with other EAs and modifying their orders. I have tried to contact the vendor for weeks with no success. Anyone else with the same problem? Did anyone manage to get support from the developer? You may be blocked by a spam filter, I know they were having issues with a few certain ISPs not getting through to them. Try emailing them via another domain email. As for your modify problem, are you by chance using the trailing mode? Is it possible to set a max pips drawdown instead of % of balance? Loving this FlexHybrid strategy, keeps pumpin out wins with minimal drawdown. Im curious to try the other strats too but can’t pull myself away from this one. Are you using the out of the box settings on the FlexHybrid? I’ve been running the other strats for the past month on a demo account. Scalper, Half Grid and 3X Retrace trigger more trades but you have to be ready for steeper drawdowns. All but one (so far) recovered nicely, but not for the faint of heart. Yes out of the box settings for FlexHybrid, but changed risk to 0.3 and DD_stoploss to 30 trading on 20 pairs. I find the scalper more dangerous than the other 2 you mentioned. It’s great to pile in some quick cash with the scalper, but it can just as quickly get you in trouble. 1. is it better to use drawdown percentage or stop loss as a way of money management? 2. i set my virtual trade to 1 and it seems to be trading well.. however the default was 6. is that ok? 1. I use the DD_Stoploss percentage which is based on a per chart basis now. The 2xRetraceSL strategy uses a 100-120 pip stoploss and seems like it could be a great long term earner though, just not as big in profits. If you plan on using the real stop loss in pips, don’t set it too low or it will crush your profits. 2. Setting virtual trades to 1, is essentially turning Flex into an almost full martingale EA, which is fine and can make a lot of money but can get risky very quickly. If you’re going to trade like this, I suggest using the lowest risk possible. Hi guys I am a Forex trader and have tried out many robots in the past and none of them have worked so before I buy and try the Forex Flex EA I would like to know if this EA is really winning on a consistent basis. I have looked at all the trade results on myfxbook, but have seen the same type of results with other bots I have tried in the past on a demo account and did not get the same results. Also the new Flex EA 3x Retrace strategy with an 83% win rate looks good so please give me some feedback guys so I can decide if I am going to buy this EA or not. This EA is based more so on mathematics than anything else, so there is no reason why demo results won’t transfer to real at almost 1:1 unless your broker is playing you. At 17:00 the 3X account opened (the myfxbook one) opened 2 cad trades, the drawdown got well over 30% as I watched it all day. My own opened the same trade yesterday as the 3X, but today opened no trades, while the myfxbook one opened a cad, nzd/usd and nzd/jpy, so has 3 pairs with 3 open trades. I believe that account uses Half-grid strat. I am thinking of changing to 3X retrace, but because I don’t know how reliable the VPS is I am using 2X retrace. If I resave the templates to 3X can I add a stoploss like 2X does or will it ignore. The VT can be changed but can SL? Thanks. Asking before I try, as I logged into the forexflex website but there was no ‘contact us’ inside the members area. If I can add a SL for safety to the VPS MT4 I think I will. The results from 3X are better, and doubling instead of tripling will give me more profits…with the VT8 I use. I even started a myfxbook of my account. I think it is a great tool. If your VPS can run 2x retrace, it will have no problem running any other Flex strats. You can add a stoploss to 3x retrace, just select it from the strategy list, and then enter a RealStopLoss. Hi everyone i just purchase flexea..pls any can share a stratege &good setting for account of $400. Since you have only 400 dollars, it’s important that you let it calculate the lot sizes for you, which it does on the basis of the size of your account. If you leave it at the settings that are already preset, then it will do this for you.I bought it last week, and traded the default strategy on a 3800 dollar demo account. It traded it up to 3900 within 5 days taking three or four small trades. I then added yesterday the Scalper setting, and it took four or five pretty risky trades (which it eventually won by adding to the positions martingale-style) bringing the account up to 4062. I’m satisfied with this, though since I am conservative, I’m not sure I’m going to run the Scalper right away on the live account. On long trades, it seems to work by catching falling knives and then scaling in with larger and larger lot sizes martingale style until it can squeeze out a small profit when there is a pullback. The gurus tell you not to trade like this. If I want to sleep at night, it’s probably good advice. Hi Christopher, great name BTW…one of my favorite Saints! No, it just increases the lot size. I am getting quite a few and trades regularly but have not counted exactly. It just varies depending if does the additional trades, etc. This is the overall most consistent EA I have used since 2008. Yes I also bought it but see no set files in the package, how do I know what settings to use to trade the different strategies? Am I missing something? When you click on the strategy you want to use the EA will use those settings that are for that particular strategy. I personally like the newer FlexHybrid strategy the best. Mag, to add that is all you have to do…the settings will be the default of strategy in background even though will show diff when looking at input tab settings. You can verify because some things like # of buys or sells will show on chart window for the strategy you are currently running. I did really well with gap down today on GBP/JPY and good thing I had 100% DD. Too close for comfort though on that pair and just added it since Julius mentioned so thanks again Julius but I took down the extra GBP pairs you mentioned for now. They made money but seems more risky than the 10 pairs forex flex list under documentation so just sticking with that now with flexhybrid, 100% DD and 0.7 risk. Joe mentioned that 100% DD and it’s working so pulling out profit already to do it again! Mike, does cranking up the risk increase the number of trades? How many trades per week is flex hybrid giving you? Hi guys, I just bought it because of all the reviews here. Struggling with what settings to use to be conservative. I will set up a VPS on my $1330 account ECN go markets in the next couple of days. I think 7 pairs with 2X retrace, 3% drawdown, 18% a month so far…by the myfxbook. From what you guys are saying the flexhybrid is the other best one. But how come there is no myfxbook – even for a month or two? And how come the 99.9% backtests cannot be clicked on to check out? But if flexhybrid does as good as default 2 it should not be a problem. I am conservative and want about 100% a year, managed fx guys always lost my money and wanted 30% commission. Robots always lost. And trade copiers were $100+ a month. This was a spur of the moment decision. Hope we all profit. Robert, I also bought it because of all the reviews. I began the flex default on a demo account last Thursday with the “out of the box” settings. It seems to be behaving quite conservatively for me so far. To date (5 days) it has only opened and closed 4 long EUR/USD trades for an average of about 7 pips each. I guess it depends on what size you’re trading, but at 0.1 setting, it’s not much. In any case, it’s 4 for 4, so I’m not complaining. I’m doing well with it so far. The 2X is what I have on. I tested it (live) with flexhybrid, and it stayed open over the weekend on the flex, which I don’t want to do again. It was just the Flexhybrid that I could not find a myfxbook for. 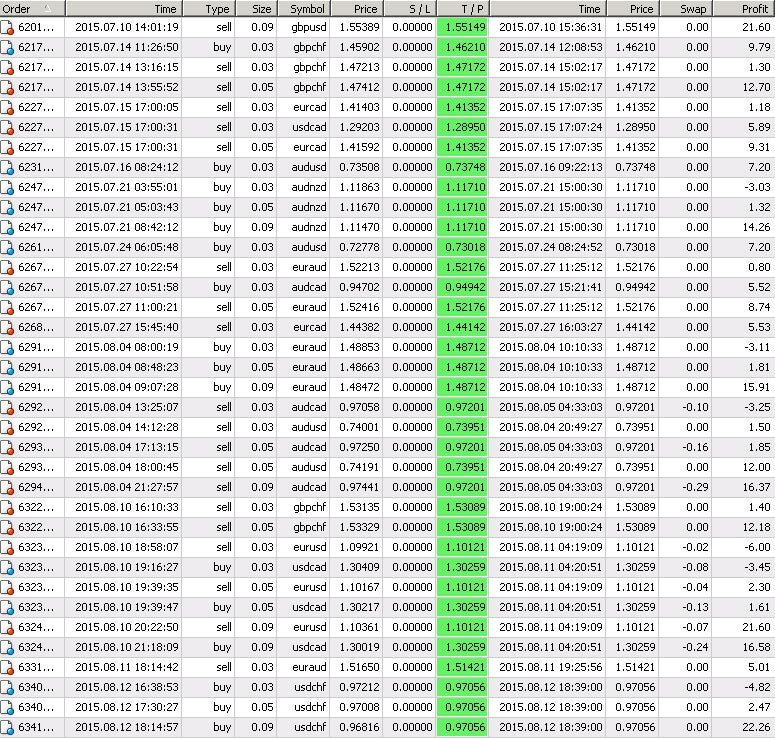 I am trading all 10 pairs vendor list on documentation and so far doing better than the myfxbook account. Also forgot to mention, flexhybrid is a lot safer than default. it opens the 1st trade and than only open the 2nd trade if a similar condition met, usually after 70 to 100 pips. Unlike default open 2nd trade after 21 pips. e.g 1st = 0.01, 2nd= 0.03 3rd= 0.09 i found 70% trade closed with 1st trade, 28% trade closed with 2nd trade, only very rare closed with 3rd trade. i found gbpnzd, gbpaud, gbpjpy, gbpchf trade often and profitable due to the nature of the currency, a lot of ups and a lot of downs, very volatile. gbpcad is the one closed with 3rd trade. but still very low risk. Thanks for your advice, these pairs work well! could anyone please share his beautiful setting with us pls. final for best result cause am loosing instead of gaining. My first month of Flex was a huge success. This is one EA I won’t be refunding that is for damn sure. I recently bought ForexFlex and am running the default settings on the six major pairs in a demo account right now. (It has not opened a trade during the two days it’s been up.) I’ve been reading the posts and am curious why people prefer to turn the risk way up. I don’t want to blow out my account right away once I go live. Can someone explain to me the advantage here? Anyone trading the Flex EA 3x Retrace strategy? Did you copy the good trading today shown on the myfxbook? Been trading a mix of x3Retrace and FlexHybrid strategies on 20 pairs… This week has been unreal so far. I’m watching my fap turbo, rev trader and others just get destroyed this week because of the Greek volatility, but Flex is just thriving in it. I love the fact it has over 10 strategies to chose from, very addicting robot to trade with let me tell you lol. Hey Kim and others regarding 100% DD. I feel same as what Joe wrote regarding this, especially the way the new FlexHybrid Strategy works. When account reaches 100% profit I will withdraw profit. “I assume you’re using the default risk and stop out percentage of 40% as well? I personally don’t like the 40% stopout and prefer to just risk it all in true grid fashion. The 40% stop and running anything medium risk or higher gives Flex very little room for error. Just withdraw profits every double up or so, any account wipe should just be considered like a losing trade. If done right you should have more double ups than account wipes. You can also go the route of letting the account grow and grow. The bigger the balance the longer it can last through big swings. But this ends up resembling stock trading, the question becomes when do you get out with your profits before it’s too late? I’m not sure I understand why you would set StopLoss_DD to 100%. If a pair has gone over 50% in drawdown, and you are trading the FlexHybrid strategy, it has attempted to do 3 trades in grid fashion, all the trades would be heavily under the water and unlikely to come back for a significant time. Wouldn’t it be more prudent to just close the trades around the 30-50% mark and start again? I have the risk turned way up for the Default strategy, trading on 10 pairs, but only 2-3 charts maximum at any point in time (as I think it is rare to get 4 or more trades at once so higher risk is better, with fewer consecutive trades). The EA trades beautifully and drawdown doesn’t generally exceed more than 15%. It seems better to me to put your drawdown maximum near where 90% or more of typical trades run to. strongly agree 100% is far far too much. i do find flexea 2.3 is very stable but still think the 1.0 risk and default 6 vt is not safe enough. i use 0.4 / 0.5 risk and default 7. that way, i can sleep and no worry. also, test your brokers, it acts very different with different brokers. ECN is STRONLY recommended. i trade both default and super preceise at the same time with all 10 pairs, so total 20 pairs. default vt=7, risk = 0.5. super precise VT=8, PS=22, risk = 0.4. dont trade very often but 90% win rate. very stable and profitable. I lose a lot money before because i over trade the account and want quick money, but after all 20%-30% is very doable with risk = 0.4 / 0.5. Thanks Julius, I added all the GBP pairs you mentioned to run FlexHybrid on. That is the strategy I personally reco with all default settings except risk at 0.7 and DD @ 100%. I reco for starting out (and what I do even after using EA’s since 2008) just use the new FlexHybrid Strategy with all default settings except me personally I changed risk to 1. and DD 100%…changed nothing else and running on all 10 charts that vendor recommends. Overall great broker IMO to use Flex with is TradersWay, ask for Joe Carney and tell him Mike sent ya. He has best customer service in the industry bar none! I have used just about every EA and top manual trading systems out there and Flex is currently my overall favorite! Especially with the 75% off, great deal…all IMO! Does DD 100% means you could wipe out the entire account? How do you know when to withdraw your money to protect against that? Yes it does, withdraw when profit when reaches 100%…so far this strategy is working for my investment but it’s just one of many…best of luck to you! FlexHybrid is the best thing that’s happened to me this year. Thing is just churning out non-stop winners everyday. I’d appreciate if someone could explain why the higher the account balance the lower the leverage should be. For example, on the FH website it is suggested that account leverage should be set at 100:1 or 200:1 for accounts over $5000 and higher leverage for smaller account sizes. Thanks in advance for any guidance offered. close all trades when floating trades reach this pct? does this mean it overrides the tealtakeprofit? Can I trade with this software with Forex.com? New FlexHybrid working nicely thus far! New Strategy “FlexHybrid” added. We’re very excited about the potential of this. This uses similar settings as the Default to open it’s first trade, but then any additional basket trades after that are only opened after those same conditions are met again, and again. This results in trades being very spread apart in a dynamic fashion within the basket allowing to survive in the worst of times. This is a very safe setting to use, however expect to have trades left open for days, maybe even weeks in rare cases. FlexHybrid is a good strategy to trade with 10 charts, on 0.1 – 0.5 risk with Max_Charts of 4-5. So Joe, you set default at 100 but do you leave the floating TP at 1%? or change to 5% like JJ? JJ, I also notice you have floating to not close until 5% instead of default 1%. So you actually have no stop loss if at 100% right? and waiting for bigger close with floating 5%? Thanks again JJ, I loaded your sauce and it’s set right regarding trailing, etc. Looking forward to some gains! I lowered risk for now…only thing I changed. So you think it’s better to set DD at 100% rather than the default 40%? Whats happening to the Forex Flex EA Real2 ForexFBI trades in myfxbook? since OCT 2014 is is almost not moving? I flat-lined the risk on a VPS, then completely forgot about it as I became extremely busy. I will turn it back up a bit. JJ, why does your settings say “trailing = 1” instead of false or true? Does it change to that if you select “your own settings” as strategy value? Ahh I dunno but it’s supposed to be ‘off’. I guess 0=on and 1=off according to MT4. So JJ Do we just enter the set file in the robot settings or what? please Explain? Right click the link and save as. Then when you attach Flex to a chart, on the inputs tab click the Load button and browse to where you just saved that .set file and it will change all the settings accordingly, then click ok.
FXDD transfered all retail accounts to FXCM. So JJ What is this/These secret sauce settings?? I got Joe to update my original comment and add the set file. Your results are a breath of fresh air to my mind. Quick summary I opened a $10k DEMO Acc. 20150429 with GCMFX. Trading DEFAULT only on AUD,EUR, GBPUSD – USDCHF & JPY Also (and clearly this is my mistake) XAUUSD. Results today are that the account has been stopped out 6 times and there is at the moment an Equity of $4583 Profit/Loss = $2560. There have been 260 trades in this time roughly (uncounted) Account History shows 30% of all trades are losses. Remember at this point, all pairs are trading the DEFAULT strategy only. In conclusion, Flex doesn’t trade all pairs!! I’ve been using EA’s since I first purchased FAPTurbo years ago. This isn’t something new or strange to me. I do see Flex as up there with the best & I will continue to take in great results like from JJ today & will succeed one day! Be carefull & trade well. I assume you’re using the default risk and stop out percentage of 40% as well? I personally don’t like the 40% stopout and prefer to just risk it all in true grid fashion. The 40% stop and running anything medium risk or higher gives Flex very little room for error. Just withdraw profits every double up or so, any account wipe should just be considered like a losing trade. If done right you should have more double ups than account wipes. I’m trying to clarify exactly how DD_StopLossPct functions. For example, if I have set DD_StopLossPct to 20%, does that mean that the maximum possible drawdown for that chart is 20% before it automatically closes all the trades for that chart only? If there are other charts they have their own settings so their trades are not affected, right? If you can clarify how that works I would really appreciate it. If you set DD_StopsLossPct to 20 on GBPUSD, all your GBPUSD trades from Flex will close if their drawdown reaches -20% of your account balance(you can change this to equity in the settings). Trades from Flex on other pairs won’t be touched. I’m told a setting will be added in the next update to select if you want it to close all Flex trades, or just that specific pairs trades.